The open bite-size 5-day learning event is back and will take place over the next five days 11-15 January 2016. Each day participants will focus on a different topic. 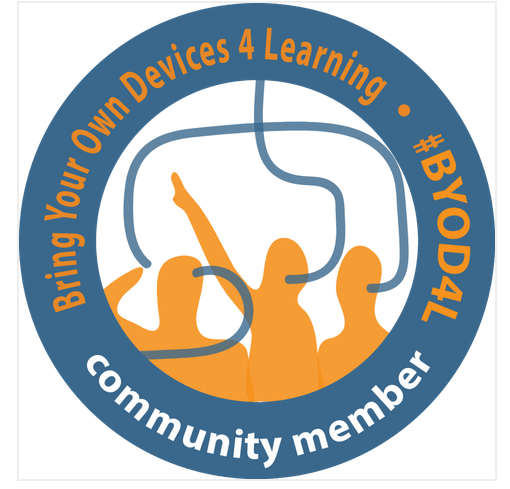 BYOD4L is short for 'Bring Your Own Device for Learning' and is an engaging CPD activity that will help you make better use of those mobile devices we all seem to have with us. Using the 5Cs Framework, the topics that form the focus over the five days are: connecting, communicating, curating, collaborating and creating. 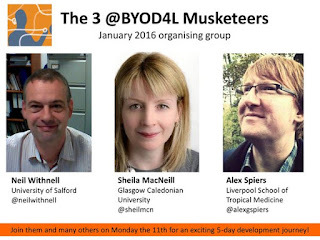 This iteration of BYOD4L is being led by three wonderful members of the community: Neil Withnell (@neilwithnell), Sheila MacNeill (@sheilmcn) and Alex Spiers (@alexgspiers). I highly recommend you reach out and connect with all three and my dear colleague Chrissi Nerantzi (@chrissinerantzi). Chrissi and I came up with the idea of BYOD4L sat at a train station in 2013 and have continued to bounce (what initially might seem carazy) ideas off each other ever since! Being connected to all four of these people has without doubt helped me to develop my thinking and each are valued members of my personal learning network. 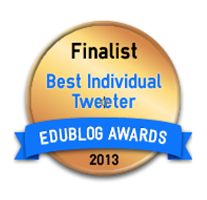 Key to developing a rewarding social learning experience is the people you can co-learn with. By connecting with like minded educators you can develop your own bespoke personal learning network. This takes time but is worth the investment. 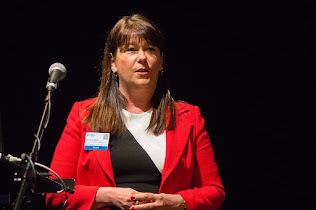 Who you connect with is a personal choice, but as Prof Simon Lancaster tweeted, a good place to start initially is the people who are taking part in #BYOD4L. 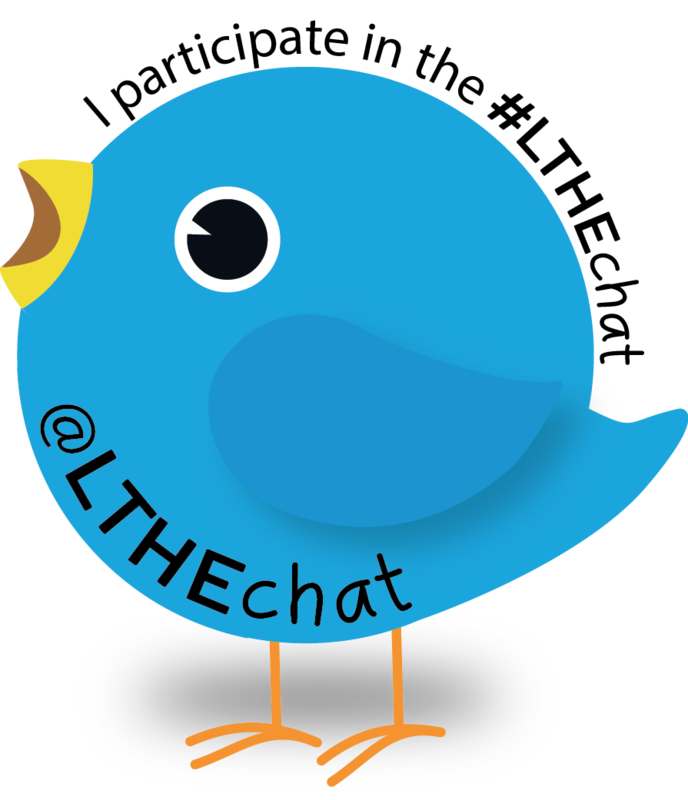 @ViktoriaJoynes @chrissinerantzi @JeanEd70 @alexgspiers just follow everyone on #BYOD4Lchat and you’re away! Kandy shared a great visual which really does sum up how Twitter can contribute to professional development and informal learning. The #BYOD4L will build as the week develops. Martin Hawksey's tagsexplorer provides a great visualisation of the emerging connections. 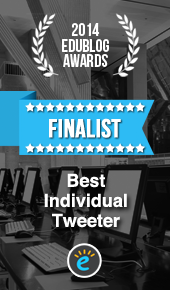 I've shared tips on getting started with Twitter and as Twitter forms one of the key spaces for making connections during #BYOD4L these might be helpful to new users of Twitter. My advice on making connections is to start by 'listening in' to Tweets during the evening #BYOD4Lchats (8-9pm GMT) and follow those people you find interesting. The next step would be to explore who they follow and see if there are other educators you feel would add value to your personal learning network. 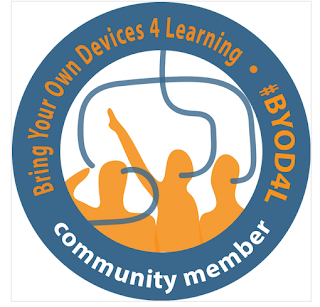 If you are blogging about your experience during BYOD4L don't forget to add the Community Badge and let others know! #BYOD4L Day 4 Collaborating or Cooperating?